HomeLINUX/UNIXHow to Install Latest PHP 7.2 and PHP-fpm in CentOS 7. Follow this link to Setup LAMP server on Centos 7. This updates package and the repositories caches. To add latest version of PHP-FPM which is still receiving security updates we need to add a third party repository being maintained by a French named REMI. This repository has latest packages. After installation you can check the list of Remi repos available for PHP in /etc/yum.repos.d directory. We can enable Remi repo related to a particualar php version. For php 5.6, we can enable remi-php56 repo. For php 7.0, we can enable remi-php70 repo. Then remi-php71 for PHp7.1 and so on till Php 7.3. Here we are going to Install latest stable PHP 7.2 on our server so we will enable the remi-php72 repo. We can enable these repos by manually editing the repo file directly in /etc/yum.repos.d directory. For example to enable PHP 7.2, we need to edit remi-php72.repo file and enable the [remi-php72] section. Or we can use yum-config-manager from yum-utils package to enable the repo easily. Update and check the version of PHP on the server. Then check the version of PHP and PHP-FPM package available on server. To make sure NGINX knows how to send PHP requests to PHP-FPM we need to add some configuration in NGINX configuration file. the default location of your Nginx configration files can be different. Usually it is in /etc/nginx/ ( 99.9%) time but it can also be in /usr/share/nginx or /usr/local/share/nginx if you compiled it from source and used default values. Assuming it is in /etc/nginx/ directory. Open nginx.conf file and add the following content to it. Here we are using a unix socket to communicate between Nginx and PHP-FPM as they offer better performance. To setup a unix socket for PHP-FPM, we can edit /etc/php-fpm.d/www.conf and make sure the value of listen directive is set to this. You can also make changes to these directives if you’re running NGINX as a particular user or group. for example if you’re running Nginx as user=newuser and group=newuser then change the follows. and should also change expose_php directive in /etc/php.ini. Further more you should also set appropriate values to following directives according to your applications requirements. After making all these changes you can restart PHP-FPM service again. To test working of PHP we are going to put phpinfo() code in our Document root. Assuming Document root is /usr/share/nginx/html/. Save this file, then Open your browser and go to http://server-ip-address/test.php and you will see all the info about PHP and server. 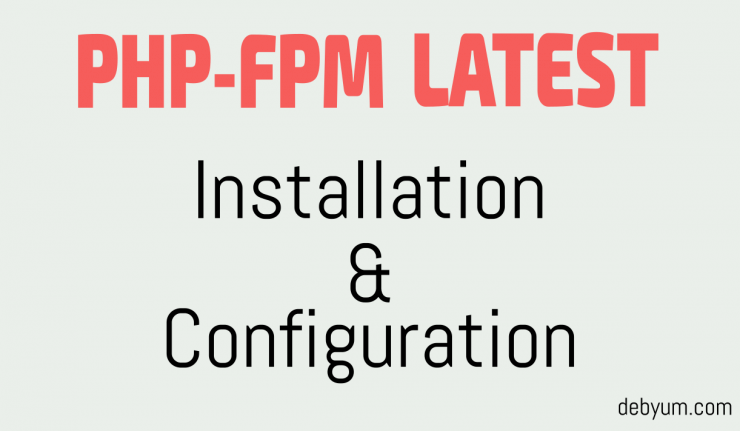 Now you know how to install and configure latest PHP-FPM in your server. This Document is very nice.You have saved my time.Thanks Buddy….. Thanks for the tutorial. You could also add if someone is using Apache with php-fpm and not NGINX.Thanks for your help.